The Best Western Hotel Sindelfingen City is well-connected to the Stuttgart Trade Fair: The fairgrounds are only a 20 minute drive away by car, or can be reached in 35 to 40 minutes by public transport. The hotel is situated next to the Daimler plant in Sindelfingen. Perfect convenience for business guests is also offered by the underground car park of the hotel and available Wi-Fi internet throughout the hotel free of charge. After seven months, on August 4th, 2016 the renovation works were finished in our hotel in Sindelfingen. We are happy to greet you now in the redesigned hotel lobby with new seating area and fresh colors. Up to the fourth floor, the hotel rooms have been equipped with modern furniture and allergy-friendly design floors. The new color concept in the rooms creates a welcoming and cozy atmosphere. In the corridors, you walk on brend new carpet floors to your room at Best Western Hotel Sindelfingen City. In the heart of Sindelfingen city centre, numerous shops, cafés and bars can be found at Wettbachplatz within walking distance from the hotel. Guests can reach the Daimler Plant in Sindelfingen in just 5 minutes and a large shopping centre is also located a few meters away from the hotel. Motorworld in Böblingen and the Daimler and Porsche Museums in Stuttgart are perfect for nice excursions during your stay in Sindelfingen. Anyone looking to explore the beautiful Black Forest will find wonderful hikingand bike trails approximately 40 km away. 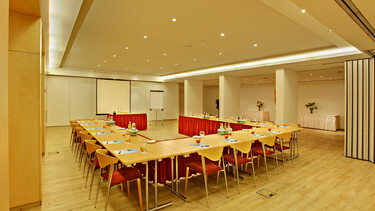 Two conference rooms are available at the Best Western Hotel Sindelfingen City for small meetings and seminars. The rooms can be combined flexibly to a large ball room. The meeting equipment and conference technic as well as the Wi-Fi are best features for successful events in the Daimler city. The hotel rooms at the Best Western Hotel Sindelfingen City offer much space and most of them were recently renovated. Comfortable beds, flatscreen TV, room safe and free Wi-Fi are part of the modern facilities. Business guests will enjoy working at the comfortable desk and in the hotel rooms. Our spacious deluxe rooms on the 5th floor are perfect for an extended sojourn in Sindelfingen. They are very spacious and partly offer an extendable couch. There is a magnificent view of our tranquil garden from some of our rooms. The hotel restaurant offers varying daily menus and small snacks. Cold drinks and regional beer are served in the hotel bar and special sport events are shown on Sky TV on a screen. Fair visitors value the central location of our hotel and the great traffic connection to the fairgrounds of Sindelfingen and Stuttgart. Important events regularly take place at both locations.